On the occasion of the Armenian Genocide Centennial, Turkish reporters insistently inquired about Armenia’s territorial claims from Turkey. Pres. Sargsyan is clearly indicating that as a head of state, demanding land from Turkey — a powerful and menacing neighbor — could have serious consequences on Armenia’s national security, which is not the case when such claims are made by individuals or organizations. Earlier that same day, the morning of May 7, during Foreign Minister Edward Nalbandian’s press conference at the National Press Club in Washington, DC, another Turkish journalist asked the same question about Armenian territorial claims from Turkey. Nalbandian gave the same answer as the President: “Armenia has not made territorial claims from Turkey.” He also wondered why is this issue raised in Ankara rather than Yerevan? The Armenian President’s answer created a huge storm of controversy in Turkey and Azerbaijan. Journalists and officials in both countries mounted hysterical attacks on Armenia, accusing Pres. Sargsyan of “urging Armenian youth to occupy Mt. Ararat and Eastern Turkey.” Insulting adjectives were hurled at Pres. Sargsyan by Turkey’s then Prime Minister Erdogan, Deputy Prime Minister Bulent Arinc, Minister Egemen Bagis, Pres. Ilham Aliyev of Azerbaijan, and the Foreign Ministries of both countries. Erdogan even demanded an apology from Armenia’s President. To incite the masses, protests were organized in Turkish cities where photographs of Pres. Sargsyan were burned! It is understandable why Turkish leaders are so apprehensive when the issue of Armenian territorial demands is raised. Knowing full well that their ancestors eliminated the Armenian population from their native lands, Turkish officials are haunted by the fear that Armenians would reclaim their historic homeland of Western Armenia, today’s Eastern Turkey! 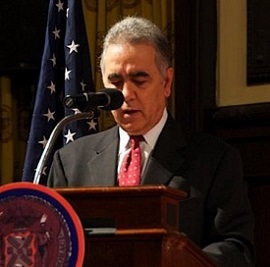 In order to unite Armenians around the same set of demands, I believe we should adopt the slogan — “seeking justice” — which includes all Armenian claims from Turkey as expressed in the Pan-Armenian Declaration of the Armenian Genocide Centennial adopted in Yerevan on January 29, 2015, by the governments of Armenia and Artsakh, and leaders of major Diasporan organizations. Paragraph 6 of that Declaration calls for “restoring individual, communal and pan-Armenian rights and legitimate interests.” Furthermore, the Declaration’s preamble specifically mentions “the dispossession of the Homeland,” the Treaty of Sevres of August 10, 1920, and Pres. Woodrow Wilson’s Arbitral Award of Nov. 22, 1920, which granted Armenia a territory several times larger than today’s Armenian Republic. Nothing less than the provinces of Erzurum, Van, Bitlis, Diyarbekir, Kharput, and Sivas. Later we’ll discuss Cilicia and Cappadocia. Territorial demand should not only be the dream of irredentist groups, it should be the official policy of the ROA! We’ve already lost 80% of our historic lands, what is there really to be afraid of…..Russian interests? Genocide Acknowledgment without Accountability is hollow and meaningless – it is worse than denial. Turkey is accountable for the crime of genocide: Land, Reparation and Restitution. Accountability is for land-acquired-by-way-of-genocide; accountability for reparation of the wealth of the Armenians acquired-by-way-of-genocide; accountability for restitution to restore everything Armenian that has been destroyed, erased, stolen, renamed by-way-of-genocide; accountability for the lives of over 2 million Armenians brutally murdered by the Turkish State. One can not speak of the Armenian Genocide without also speaking about the confiscation of Western Armenian provinces as a direct result of the premeditated and state-sponsored mass-extermination of indigenous Armenians on and the deportations from their ancestral Western Armenian homeland. Like conjoined twins, the two are permanently joined together. In other words, the native Armenians were murdered in cold-blood by non-native Turks from Central Asia to confiscate their homeland for good OR in order to permanently claim the Armenian homeland for the Turks, the Armenians had to be removed and eliminated. I look forward to the day when every inch of the Armenian homeland is recovered and restored and the cold-blooded murder of 1.5 million Armenian women and children is avenged. Since the invasion of Seljuks to our territory we live in fear and panic state . IAM wondering when we Armenians will have the guts to say what we really want . Armenians in motherland or disappora must realize the fear is not the solution to our cause. What do Armenians want? Simply stated, nothing more than that which was taken from them. The extent of the offenses are well-documented,, and not just Turks, but Western and Western-allied interests and governments also were involved and so remain to this day. Armenia’s territorial claim is legitimate under the international law. The real threat is the future irrational behavior of the Turkish Government. This risk can only be neutralized by NATO members and Russia. Already there is a clear understanding among the Europeans, the US and Russia that Turkish Nationalism which includes Islamic Extremism principles at its core (despite its claims of secularism) posses a threat to the free world. Turkish government’s continued genocidal policies against all non-muslims and Turkish open support for extremist elements in Syria and Iraq speak louder than its gold plated and fake constitution. I will go on a limb here, and opine a little different. Yes we want all of that. As the cat dreams of sleeping sparrows, so we too dream of getting our lands back. Well what if we did get them back. There is the Turkish or Turkified population. Do we plan to kill them all? I don’t think so. Restrictive policies? There would be more of them still even if you were to revive all the martyrs. All Armenians can hope for is an area within Turkey, like an American Indian reservation, and restitution. Armenians are no longer the peasants of yesteryear. They will need to scatter and ply their trades. Armenians will not turn peasant. The only way to totally turn around the Turkish Muslim mentality about the Armenians, is to make the reparation process very generous. Appraise the properties at twice their present value. You’ll see the Turks begging us to take our properties back. The Armenians and the Turk can easily decide. Either the Armenian receives double indemnity from the state, or the Turk does. Make it a private agreement between present and former owner. This way, if any Turks claim that they too were injured, they should benefit from the same law. Otherwise we will have an Israel-Palestinian conflict scenario. All we want is a place in the sun in safety. Nothing would make sense until most of Armenians gather in Armenia and work toward creating superpower country.